climate change | Small Farmers. Big Change. How Can we Respond to News that 2015 is the Hottest Year on Record? On Christmas Eve 2014, journalists working at the Guardian received the following email from their editor, Alan Rusbridger. This time next year I won’t be the editor of the Guardian: indeed, well before that I’ll have stepped down. I’m not at all depressed. This is the right time to be moving on. But I do have an urge to do something powerful, focused and important with the Guardian while I’m still here. And it will be about climate change. Rusbridger’s email sparked a series of discussions among his team, eventually leading them to take on, “The Biggest Story in the World: The Race to Save the Earth.” The journalists began focusing on stories that would motivate readers and listeners to understand the desperate need for urgent action. In March 2015, they initiated a full-fledged campaign, entitled Keep it in the Ground. Based on the work of Bill McKibbon, who founded the 350.org climate campaign that launched the divestment movement, the Guardian is calling on the world’s biggest medical charities – the Bill and Melinda Gates’ Foundation and the Wellcome Trust – to divest from fossil fuels; and to encourage others to follow suit … before it is too late. It now appears that the work of Bill McGibbon, 350.org, the Guardian, and many other activist organizations and individuals is growing exponentially. On September 22nd, the Guardian ran an article, “Institutions worth $2.6 trillion have now pulled investments out of fossil fuels,” in which they announced that a coalition of 2,000 individuals and 400 institutions have pledged to shift their assets from coal, oil and gas companies to tackle climate change. Here closer to home in the U.S., we at Equal Exchange have seen first-hand, not just the brutal storms that have devastated parts of the Northeast, the droughts and wildfires that have ravished the West, and all the other evidence of climate change in our own communities, but sadly the impact that unpredictable weather patterns and unusual climatic occurrences are wreaking on our farmer partners across the Global South. So many of the advances that our farmer partners have been able to achieve through our work and the Fair Trade model, are tragically disappearing. In fact, the livelihoods – and in some cases, the very existence – of many small farmer co-ops is now threatened. But, there’s even more exciting news since this Guardian article was published! Equal Exchange has joined a coalition of 18 environmental and social justice organizations working with Divest-Invest to encourage individuals to join this growing movement. While the work will continue on, we have all agreed to step up our efforts, through October 18th to collect as many pledges as possible. As of this morning, the number has grown to 24,868! And so, for the sake of our farmer partners, ourselves, and families, and the health of our planet, we invite you to join us to take the Divest-Invest Pledge. Whether you are a thousandaire, a millionaire, or have no money at all, taking the Pledge NOW sends a strong message! Read more here about our initiative and ways you can help. Click here to take the Pledge. So, congratulations to our Equal Exchange West Coast team, and all the other kayaktivists, general activists, and other leaders for winning the fight! Shell has abandoned plans to drill for extreme oil off the coast of Alaska!! In the end, of course, it wasn’t actually a boat, a petition, or even a swipe of President Obama’s pen that Shell claimed had changed their plans and stopped them in their tracks: it was economics, pure and simple. Costs ran over and investors dried up. Equal Exchange, Divest-Invest, and a Coalition of 18 other organizations, are now calling on everyone, whether you’re a thousandaire, millionaire, or only have a couple dollars in your pocket — to pledge to be among tens of thousands of others saying no the fossil fuel economy and yes to our clean energy future. When we all act together, we’re unstoppable and another world is possible. Sell any existing assets tied to these oil, gas, and coal investments within 3-5 years. Roll a portion of investments into climate solutions like clean energy, sustainable agriculture, local business, and many more. Click here to sign the pledge and be counted. Divestment and clean energy investment are sweeping the planet. In the last 2 weeks, Celebrities like Leo DiCaprio, Mark Ruffulo and more have divested. While institutions and leaders have pledged to move their money – over 2.6 Trillion and counting! – out of fossil fuels and into the clean energy economy. The latest big news was Mayor Bill Deblasio of New York who is beginning to move the pension funds of America’s largest city out of dirty fossil fuels and into clean energy instead. If you’re ready to join these leaders from the stage and screen to the streets of New York by owning what YOU own, Click here to sign the Divest Invest pledge with great partners like Divest Invest Individual, Equal Exchange, Daily Kos, 350.org and more. Read more about Equal Exchange’s climate justice initiative, and how you can help, here! A New Perspective on Combatting Climate Change: Support Soil & Small Farmers; Not Oil and Big Agriculture! As the world’s governments, scientists, farmers, industry representatives, and activists get ready for the next round of UN climate talks in Paris this December, hundreds of declarations, statements, proposals, and treaties are being drafted to address the dangerous situation in which humans have gotten ourselves and our planet. There are many proposals out there but two pathways are clear: First, we must divest from the fossil fuel industry in all its facets (mining, drilling, burning, etc. ), and instead invest in renewable energy sources. And secondly, we must break away from industrial agriculture, and in its place invest in small scale, organic, regenerative farmers. Ultimately, any path toward a climate change solution is going to require that we work together to rebuild and reshape our economy. It is more than time to move away from our current system which encourages and rewards corporate greed and control and work to create a new, solidarity economy, of co-operatives and socially responsible businesses, that places people and the planet above profit. Equal Exchange is proud to launch our new Climate Justice Initiative, focusing on this two-fold approach: Soil not Oil. Our farmer partners are doing their part. Read what Equal Exchange is doing and how you can join us to help our partners mitigate, adapt, and build resiliency all while taking steps to help combat the greatest challenge we may face in our lifetimes and those of future generations. 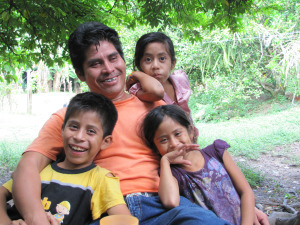 Victor Hugo Garcia Lopez relaxing with his children after offering me a tour of his organic coffee farm. Co-op Food Stores in New Hampshire has a strong commitment to supporting family farmers, sustainable agriculture, and what we like to call the “cooperative supply chain” which basically means, co-operatives supporting other co-operatives. In the case of Co-op Food Stores, we have created a very special relationship between CIRSA, one of my favorite coffee co-ops in Chiapas, Mexico, Equal Exchange, and Co-op Food Stores. This “sister co-op relationship” is part of the Co-op brand coffee program that we have created, whereby for every pound of Co-op brand coffee sold, Co-op Food Stores and Equal Exchange each invest 20 cents into the Sister Co-op Partner Fund. Money from this fund goes directly to CIRSA to support their efforts to build resiliency in the face of dramatically changing weather patterns. In Simojovel, Chiapas, where these communities of indigenous small-scale farmers make their living exclusively from the production and sale of their coffee, unseasonably long rainy seasons and the “roya” (coffee rust disease) has reduced their overall yields by 70% in the past two years. Co-op Food Stores and Equal Exchange have raised enough money to help CIRSA build solar dryers which keep the coffee dry even under relentless rains, in two of their thirteen member communities. We are now trying to raise money for additional dryers in the remaining communities. Below is an article written by Amanda Charland, Director of Outreach and Member Services for Co-op Food Stores. For more information about this partnership please go here. To learn more about how you can support Equal Exchange’s Climate Justice Fund, where 100% of the donations go directly to support our farmer partners in their efforts to build resiliency in the face of climate change, please call Phyllis Robinson, Education & Campaigns Manager, at 774-776-7390. To make a donation to our Fund, you can also send a tax deductible donation to our NGO partner, Hesperian Health Guides, 1919 Addison Street, Suite 304, Berkeley, CA 94704. Be sure to write Equal Exchange Climate Justice Fund on the check. When I left New Hampshire, bound for Mexico, it was three in the morning and snowing. In the rush, I barely stopped to think about the routine filling of my coffee mug, except for the momentary relief the hot beverage provided from the cold. As I trudged through the snow, grasping my warm beverage, carrying all my belongings for the week on my back, I never realized that I was about to say goodbye to something. After this trip, my relationship with coffee would never be the same. The minute my feet hit solid ground after a very long day of flights, my appreciation for coffee had already grown tenfold. The sheer distance we had traveled was exhausting, and we still weren’t at the coffee farms! Our mission in Mexico seemed simple enough: meet with our sister cooperative—a partnership project set up by Equal Exchange—and learn about the process of coffee. I thought, “I know what to expect. I’ve seen videos and pictures of coffee being harvested.” In a very small way, I was right. The physical processing of the coffee is pretty straightforward—very labor intensive, but straightforward. I was very wrong about the rest of the story. Coffee farming is complicated and surrounded by a web of influence that pictures and videos can’t describe. Equal Exchange was founded 22 years ago to change the way business is carried out and trade is conducted; to expand and deepen the opportunities for consumers and producers to relate to each other; and to change an anonymous, corporate-controlled food system to one in which each participant is treated with respect and dignity, and whose contribution is recognized and valued. Integral to this vision is an economic model that builds vibrant, healthy businesses and communities. Together, we’ve accomplished a tremendous amount and have successfully paved the way for each of these goals to be realized. Through our co-operative structure, and by supporting other co-operative business models, we are building an alternative network of democratic, mission-driven businesses that place relationships above the bottom line. Fair Trade has entered the mainstream; consumers are increasingly demanding information about where their food comes from, insisting that conditions are fair for those who grow it, and increasingly see themselves as advocates for a just food system and a healthier planet.